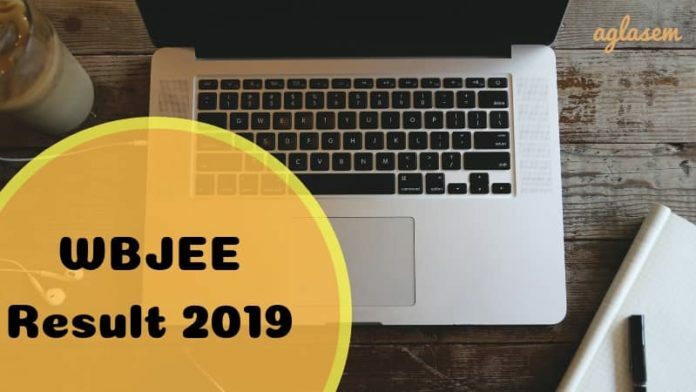 WBJEE 2019 Result – West Bengal Joint Entrance Examination Board (WBJEEB) announces WBJEE Result. Candidates can download WBJEE 2019 Rank Card at wbjeeb.nic.in or wbjeeb.in. Those who appear for West Bengal Joint Entrance Examination (WBJEE) can check WBJEE 2019 Result at wbjeeb.in as per the schedule. For the purpose of checking result, candidates have to log in using application number and password. On the basis of rank obtained, candidates will be able to participate in counseling of WBJEE 2019 for admission to undergraduate engineering, architecture, pharmacy courses. Candidates can keep a track of WBJEE 2019 Result from the table provided below. 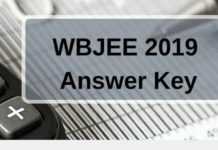 Check Result: WBJEE 2019 Result will be available at www.wbjeeb.in. How to Obtain a Duplicate Rank Card? If a candidate needs a duplicate rank card even after the completion of counseling and admission conducted by the Board, the same can be provided. In order to get a duplicate rank card, the candidate will have to apply to the Board and pay a processing fee of Rs. 500/- by Demand Draft has drawn in favor of “West Bengal Joint Entrance Examinations Board” payable in Kolkata. The GMR shall be prepared based on the total score obtained in Paper-1 and Paper-2. This list shall be applicable for admission to all Engineering / Technology / Architecture Courses and to the Pharmacy Course at Jadavpur University. Counselling and admission will be done on the basis of GMR only. Candidates appearing in both paper-2 and paper-2 will secure both GMR and PMR if scored above the cut off mark. PMR shall be applicable for admission to all Pharmacy Courses except at Jadavpur University. 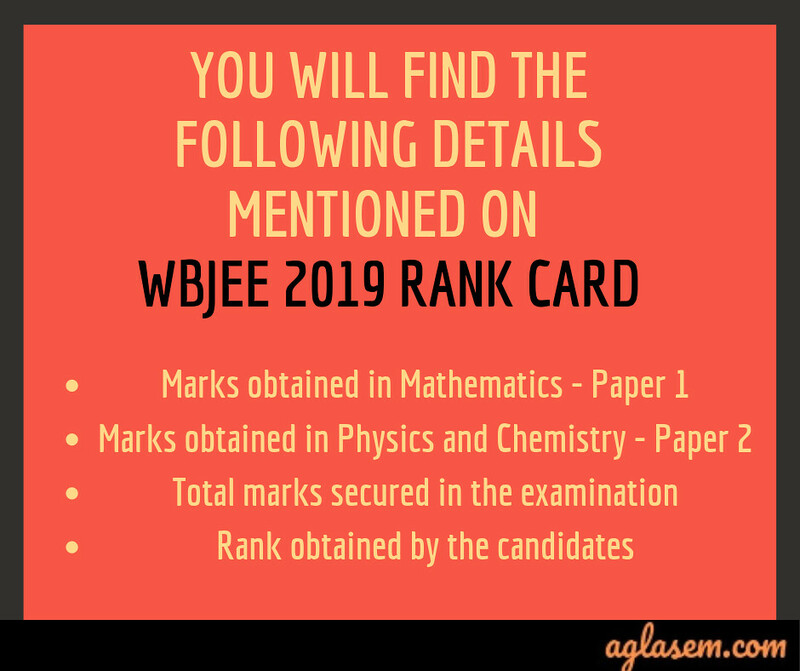 WBJEE 2019 Result Ranking shall be done in the descending order of marks scored in paper-2. Counselling and admission will be done on the basis of PMR only. Note: Candidates appearing only in paper-I will not get any rank. together will be considered higher in merit. Another scenario could if the tie still exists, the candidate who will score more positive marks in Mathematics and Physics taken together will be placed higher. If this does not break the tie, the candidate with more positive marks in Mathematics and Chemistry taken together will be placed higher in merit. If the tie is not resolved, the candidate with less negative marks in Mathematics and Physics taken together will be given preference. Candidate with more positive marks in Mathematics for only the 2 marks questions will be placed higher if the tie is still not resolved. Followed by more positive marks in Physics for only the 2 marks questions, and then more positive marks in Chemistry for only the 2 marks questions if the tie is still not resolved. If the tie is still not resolved by applying the above methods, then the candidate with less negative marks in Mathematics for only the 2 marks questions will be placed higher. To break the tie, the candidate with less negative marks in Physics for only the 2 marks questions will be placed higher in merit. The final tie-breaker criteria will be by considering the date of birth of the candidate, The older candidate will be given preference over the younger one. Date of Birth of the candidate will be considered if the tie is not resolved by applying the above methods. The candidate older in age will be given preference over the younger candidate. The cut off for WBJEE 2019 is the minimum qualifying marks which the candidate will need to obtain in the entrance examination to qualify it. The WBJEEB publishes the opening rank and closing rank, on the basis of which candidates will be shortlisted for WBJEE 2019 Counselling. The WBJEE 2019 Cut off is not yet announced. However, a candidate can check previous year statistics and set their goals. To know the previous year cutoff of WBJEE candidates will check the opening and the closing rank. It will state the lowest rank at which the admission to an institute will begin and highest rank at which it will end. It will be determined according to the score obtained by the candidate in the exam, WBJEE Rank, the number of seat availability, the level of difficulty in the exam, the number of candidates appeared. The expected WBJEE 2019 cutoff can be evaluated on the basis of last year opening and closing rank, of top 10 institutes. The counseling details and dates will be announced after declaring WBJEE 2019 Result. The candidates will be able to check all the details about the exam from www.wbjeeb.nic.in. The Board will only allow those candidates to appear for the counseling, who will qualify the exam as per WBJEE Result and will fulfill all the eligibility criteria. During the counseling, the candidates will have to be present in person. The course and institute-wise seat matrix will also be provided with the counseling details. Before the counseling, the documents will be verified by the candidates at the reporting center. The reporting center address and other details will also be provided to the candidates. 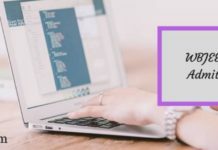 How to Check WBJEE 2019 Result? Click on the link above to check WBJEE 2019 Result. Then, the candidate will have to log in using the application number, password and security pin. After a successful login, the results will be displayed to the candidates. Candidates will be able to check their respective results and ranks by downloading the WBJEE 2019 Result. Lastly, take a print out of the rank card for the further admission process after WBJEE 2019 Result has been declared.